Saudi Arabia tells us that they have lots of oil, but if we look at graphs of their historical production, there is nothing that looks like an upward trend. In fact, recent production is lower than it was in the late 1970s and early 1980s. 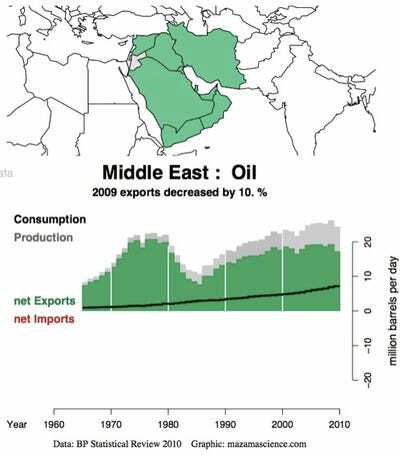 This is a graph of Saudi oil production, consumption, and amount of net exports, from Energy Exports Databrowser. 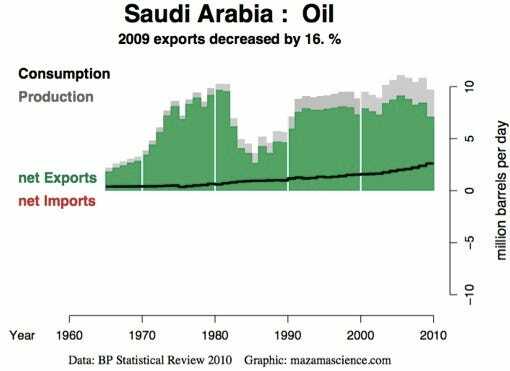 Exports, in green, are down because Saudi Arabia is consuming more and more of its own oil, so there is less available for others. This graph doesn’t fit well with what we have been told. The rest of the Middle East claims huge reserves, too, but looking at the Mideast in total doesn’t give a much more favourable picture. While production is a bit higher in total now, exports (in green) are down from the 1970s because of rising consumption. It is almost certain that the Saudis are overstating their capabilities. The reserves for Saudi Arabia and the rest of the Middle East are not audited, nor are their supposed “spare production capacities.” They may have some spare capacity, but not the amount stated. When oil prices spiked to $147 barrel in July 2008, Saudi Arabia and others in the Middle East increased their production a bit, did not really come through with a huge surge in production, the way one would expect from their suppose spare capacity. 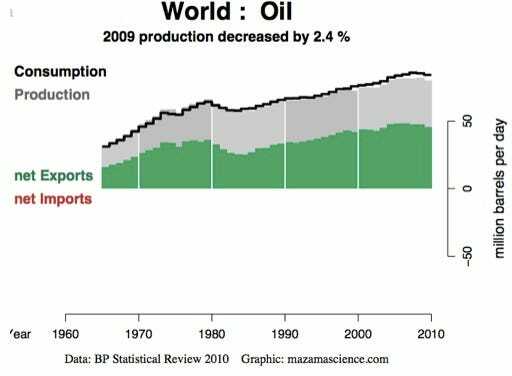 World oil supply has been roughly flat since 2005. Many are concerned that oil production will actually begin to fall in the next year or two – what is referred to as “peak oil” in the Wikileaks cable. The Oil Drum has published many posts over the years relating to Saudi Arabia and the rest of the Middle East’s likely inability to produce as much oil as they claim they can. These are excerpts from (or comments about) a few of them. Click on the titles to access the posts. You can access other posts by the same author by clicking on the person’s name. 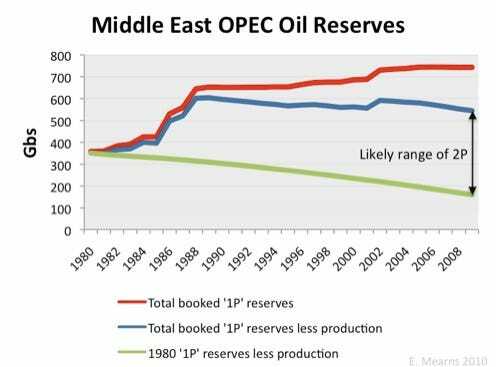 Comparison of official ME OPEC reserves with official reserves adjusted for production and pre-nationalistaion reserves figures adjusted for production. The arrow gives the likely range of 2P reserves. Saudi Aramco has effectively used propaganda methods for at least the last fifteen years to convince many governments, corporations and individuals to believe their statements. However, Aramco’s statement that it is the world’s leading oil producer is now false as it now second after Russia since 2006. Nevertheless, Saudi Aramco’s repeated statement about remaining recoverable oil reserves being 260 billion barrels (Gb) is still generally accepted. In 2004, Saudi Aramco stated that its oil initially in place (OIIP) has been growing steadily since 1982. There is considerable doubt about the validity of this increase, given the lack of new oil discoveries and the unusual nature of its steady continuous increase. Aramco stated the OIIP was 700 Gb at year end 2003 while a more realistic estimate is 580 Gb. Aramco may have some high recovery factor fields such as Abqaiq and Shaybah, but an average recovery factor range from 30-37% is assumed for the total OIIP in Saudi Arabia’s fields. The trend of the recovery factor for Saudi Aramco indicates that there has been no effect on the recovery factor by recent technological advances in producing wells. Saudi Aramco has kept remaining recoverable crude oil reserves constant simply by artificially increasing the OIIP each year since 1982, accompanied by an unrealistically high average recovery factor of 52% since 1988. If they don’t have a lot of additional oil to put on the market, it is hard to ask somebody to do something they may not be able to do. We published a Press Release about this post, also. This forecast for is on a broad basis (Crude and Condensate and Natural Gas Liquids) for Saudi Arabia. Forecast numbers are production capacity. Actual production may be lower depending upon demand. Forensic analysis regarding how the oil/water mix that is extracted seems to be changing to more water, less oil in Saudi Oil fields. The red portions of the bands are oil. Two cross sections of a reservoir simulation of the northern portion of the ‘Ain Dar region of Ghawar at various years. colour represents volumetric water saturation in the rock pores. 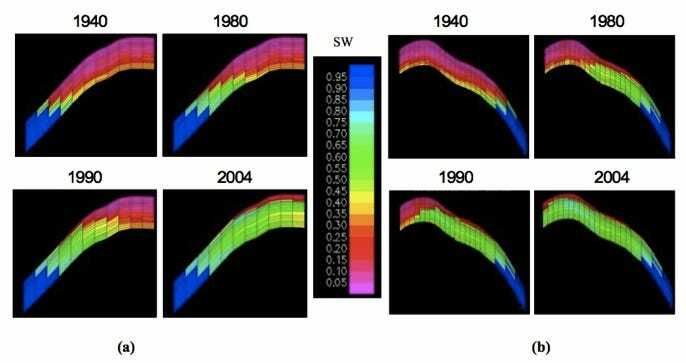 Source: Figure 9 of Alhuthali et al, Society of Petroleum Engineers Paper #93439, March 2005. An attempt to understand depletion levels in Ghawar. 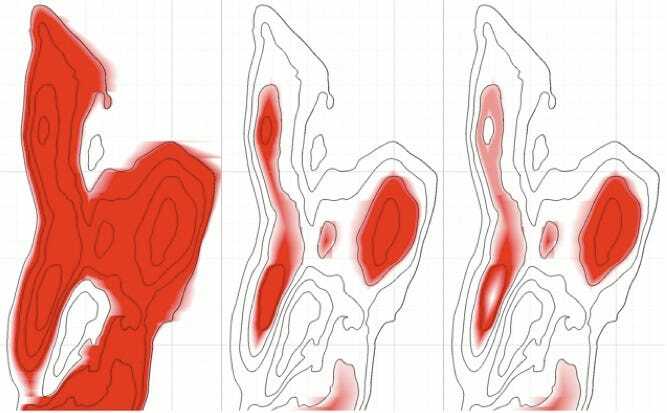 modelled distribution of original reserves in ‘Ain Dar/Shedgum area of Ghawar (left), oil water contact offset by 511’ vertically upward (centre) and the same with the effect of gas caps (right). On present trends, just to replace the oil reserves that will be exhausted and to meet the growth in demand, between now and 2030 we will need 64 mb/d of new oil-production capacity, six times the size of Saudi Arabia’s capacity today. This post originally appeared at The Oil Drum.